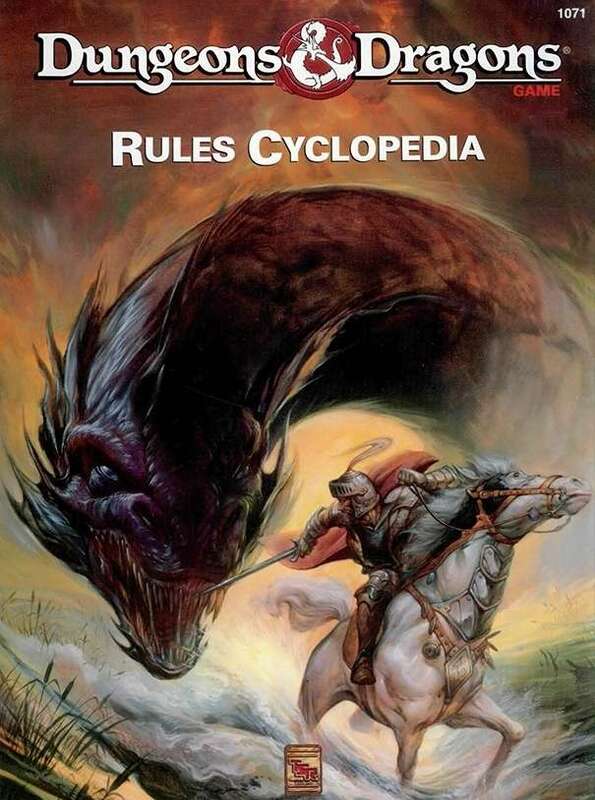 For many, the D&D Rules Cyclopedia is the definitive version of D&D. As for me, I liberally stole ideas from it to slap into my 1e / 2e campaigns. It really is a damn good version of D&D. I received numerous emails informing me that the D&D Rules Cyclopedia is now available in Softcover and Hardcover via RPGNow's Print on Demand service. $25 in softcover, $30 in hardcover. I expect to see those aftermarket prices as a collectible start to fall on this one. Hmm how are they handling all the maps in the POD book I wonder? If I recall that came with a few decent maps. Unfortunately they are color pages in the back of the book you would have to piece together if you wanted a large map. Cardboard boxes and full size maps are sadly a bridge too far for PoD at the moment. Lost 1980s printing technology? The maps weren't really that well done in the Cyclopedia, originally. It was the most disappointing part of an otherwise excellent book. It's not that they look bad, but rather they are just a random collection, with no context. Several are clearly chunks of poster size maps, with parts of place names cut off at the edges. And, bound in the middle of a thick book, the binding obscures part of them. For the most part, I don't really care about POD. I have a duplex laser printer and a three hole punch. Now that we have that out of the way. Where's my POD of The Temple of Elemental Evil? I saw that yesterday on my lunch break and nearly did a spit take. I had one ordered not three minutes later. I really don't have any pity for those after market guys. Long live POD! Forgive me if this is a ridiculous question, but how easy--in your opinion--would it be to drop the City of Greyhawk into a non-Greyhawk OSR game? I took a look at my original copy. It shouldn't be hard. Most of the city is undetailed. Largely, the text covers a number of mini adventures, and a number of high points of the city, as well as a few of the local areas nearby. It's one of the products that was made to work with 1st and 2nd Eds. Really, it's pretty sand-boxy, and you could easily reskin it to fit your needs. What it isn't is Waterdeep, where you can get the backstory for the ally cats behind every residence. It's also an inland city, on a river, not a big coastal port.